The programme aimed at collecting citizens' feedback is underway at Hotel Ashok in Chanakyapuri in the national capital. PM Modi said the national campaign is being launched with the aim to formulate a blueprint or 'Sankalp Patra' for the upcoming polls. 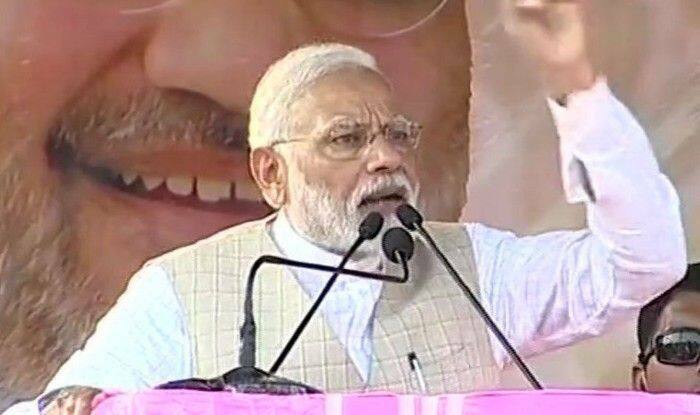 New Delhi: Prime Minister Narendra Modi on Sunday urged people to participate in Bhartiya Janta Party’s (BJP) national campaign ‘Bharat Ke Mann Ki Baat’ for upcoming Lok Sabha Elections. The programme aimed at collecting citizens’ feedback is underway at Hotel Ashok in Chanakyapuri in the national capital. PM Modi said the national campaign is being launched with the aim to formulate a blueprint or ‘Sankalp Patra’ for the upcoming polls. BJP president Amit Shah and Union Home Minister and Chairman of the Resolution Committee Rajnath Singh was in attendance at the event. Shah kicked off its much ambitious Mission 2019 – a month-long ‘Bharat Ke Mann Ki Baat – Modi Ke Saath’ – to enlist views of at least 10 crore families to prepare the road map for the drafting of party’s manifesto in order to ensure a progressive and prosperous India. “It will be a people-oriented programme and not merely a party programme. This campaign and people’s feedback will help ensure a strong and prosperous India,” Shah said at the event. The party chose a waiter at the hotel, where the programme was held, to offer the first suggestion. Over 300 vehicles will move across the country and over 7,700 boxes will be carried across 4000 assemblies to seek people’s views, he said, adding social media and telephonic communication will also be used for this. This campaign by BJP will endeavour to connect directly to 100 million people to take their suggestions to prepare its manifesto for the General Elections. In order to become a real reflection of the public’s suggestions, this campaign will try to reach the masses through various mediums.